Rivets are used to permanently fasten two or more objects together. They are cylindrical on one end with a head on the other, similar to a screw without grooves. Once the rivet is inserted through a hole in each object, the cylindrical end is hammered forcefully until it forms a second head and is secured in place. If a rivet becomes loose, hammer it down again with the help of a partner. 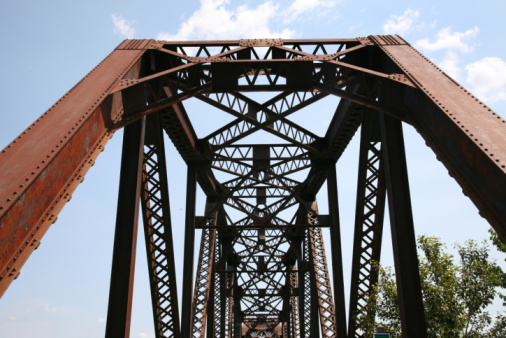 Rivets are used to secure everything from airplanes to bridges. Direct your helper to stand on the side of the rivet that has not been hammered. Ask your partner to press down and brace himself against the rivet with a heavy object, such as a brick. Stand on the opposite side of the rivet and bang it forcefully several times with a hammer. You should feel the rivet digging into the objects it holds together, but not exiting through the opposite side. Pour water on the rivet from your side and ask your partner to check for any leaks. Hammer it again if water seeps through the rivet hole. Repeat this process until the leak stops. Michael Spinola has worked in the health and fitness industry since the age of 16 when he managed a youth dance troupe in Oakland, California after comprehensive group exercise training. He’s pursued health and fitness by working in the supplements department of a health store, the health department of the American Red Cross and now as a personal trainer.